During the 2011-12 academic year, Clarion University-Venango Campus has celebrated 50 years of growth and community partnerships. As the campus embarks on its next 50 years, it will do so with a new moniker – Venango College of Clarion University of Pennsylvania. Following a year of discussion within the university and community, Clarion University President Karen Whitney has announced that on July 1, 2012, Venango College will join the three colleges of the Clarion campus – the College of Arts and Sciences, College of Education and Human Services, and College of Business Administration. She made the announcement during the 50th Anniversary Founders Dinner April 26 at Robert W. Rhoades Center, Venango Campus. A proposal to create Venango College was, therefore, developed and discussed university-wide and in the community during the past year. Over the last few years, Venango has launched six new programs and many new program tracks, including a new technical concentration within its Associate of Applied Science in Industrial Technology degree to prepare students for upward career mobility in Marcellus-related and other natural gas industries. Most recently, in January 2012 and April 2012, respectively, the Pennsylvania State System of Higher Education Board of Governors approved a new Bachelor of Science in Allied Health Leadership degree, and a Bachelor of Applied Science in Technology Leadership degree. Several additional proposed programs are currently in development. New academic programs developed at Venango always meet two criteria: they must address priority educational needs in our region; and they must have the potential for quality and, where possible, accreditation. “The creation of Venango College is certainly well deserved, given the maturity and success of the programs offered at Venango Campus,” said Clarion University Provost Ron Nowaczyk. The designation as a college is more than a name change. The concepts of stacking credentials and partnerships set Venango apart. “The idea is to begin the post-secondary experience at the certificate or associate degree level, and as you progress, have the opportunity to earn additional credentials as you reach certain milestones. We’re considering the range of programs that we offer and continuing to develop new opportunities, or steps, on an educational and career ladder,” Reber said. The campus’ vision is that over time, students will have increasing opportunities to earn a certificate that can lead to an associate degree, an associate that will lead to a bachelor’s, and so on. “We offer a growing number of programs in partnership with other universities, technical institutes, health care agencies and other affiliated organizations,” Reber said. “Students combine university course work with technical programming, and the technical credits are part of our curriculum plan and count toward an associate or bachelor’s degree. As Clarion University-Venango Campus has grown, the campus’ out-of-classroom programs and services have also expanded to provide a full complement of activities and opportunities that enhance and support the academic mission. 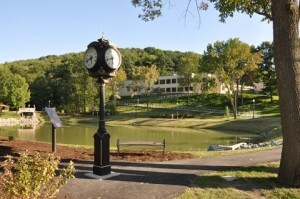 Services at the campus include a wide and growing array of student organizations, student activities, speaker and cultural events, career and counseling services, club sports and recreational activities, a modern fitness center and upscale student apartments that are owned and operated by Clarion University Foundation, Inc. Prior to joining Clarion University as executive dean, Reber worked at Penn State Erie, The Behrend College, for 18 years. Penn State Behrend achieved college status in 1973, and Reber became keenly aware of the transformational impact that college status had on Behrend’s development. “College status had everything to do with Behrend College’s growth. It brought a sense of credibility to Behrend, which became an academic destination of choiceas Behrend College of Penn State in the eyes of students, faculty, staff and the community,” Reber said. Enrollment has climbed from 1,800 in 1981, when Reber began working there, to nearly 5,000 students today. Venango is currently enjoying record enrollment of more than 1,000 students in campus and campus-based programs, and Reber anticipates continued growth. Additionally, designating Venango as a college provides a clearly identifiable college home for the four academic departments located there: the Department of Nursing, Department of Allied Health, Department of Applied Technology and the Venango Department of Arts and Sciences. It provides students, faculty, staff, alumni and the community with an enhanced sense of academic and institutional stature and creates new opportunities to promote the campus to regional and out-of-town students and constituents. Venango currently offers 11 associate degrees, six bachelor’s degrees and a master’s degree, in addition to a wide variety of non-credit continuing education programs and certificates. The campus offers the certificate and associate degree programs commonly found in community colleges, and the niche bachelor and graduate degrees that provide upward educational and career mobility for Clarion students and students who transfer to Clarion from other institutions throughout the region, the commonwealth and the nation. The Venango College of Clarion University is poised to begin its second 50 years of service to the university, the region, PASSHE and beyond with new momentum and upward trajectory appropriate to its distinct mission.